The Asus Transformer Book Flip TP200SA has its limitations, but for those on a tight budget this compact 2-in-1 laptop has plenty to offer. Tablets are great for when you're out and about, but sometimes you need something a little more versatile to get some work done. The Asus Transformer Book Flip TP200SA is just such a device: a 2-in-1 laptop-tablet hybrid. Like the Dell Inspiron 11 3000 Series that we reviewed recently, it's a 2-in-1 that allows you to flip the screen around 360 degrees, rather than remove the keyboard. The Flip TP200SA is the latest in a long line of Transformer Books, but this one has a particularly lightweight and compact design that puts it firmly at the tablet end of the hybrid device pool. And for a $499 laptop, it's impressively light and slim, weighing 1.2kg and measuring 18.4mm with the lid closed. This A4-sized slab of brushed-metal-effect plastic can easily be stowed away in a backpack, and the 360-degree reversible screen hinge means you use it in a number of different modes. The hinge itself feels reasonably robust, and should be able to hold up after multiple twists and turns. 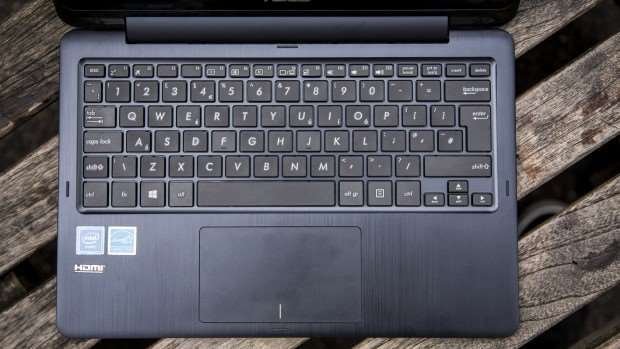 However, like some other 360-degree laptops that we've tested the Flip's screen had a tendency to bounce back and forth while being used it as a laptop, so it may not be ideal for anyone who's particularly heavy-handed when typing. You really notice it when you tilt the screen back, too, and the top-heavy screen visibly raises the edge of the keyboard tray off the table when you lift your hands away. The Flip's built-in sensors can automatically detect when the screen goes beyond 180 degrees, at which point it switches itself into Windows 10's Tablet mode and locks the keyboard so that you don't accidentally bash the keys when they're underneath your fingers. You don't necessarily have to fold it flat, either, as you can also position it in a kind of kickstand mode – handy if all you want to do is watch a film or take someone through a PowerPoint presentation. 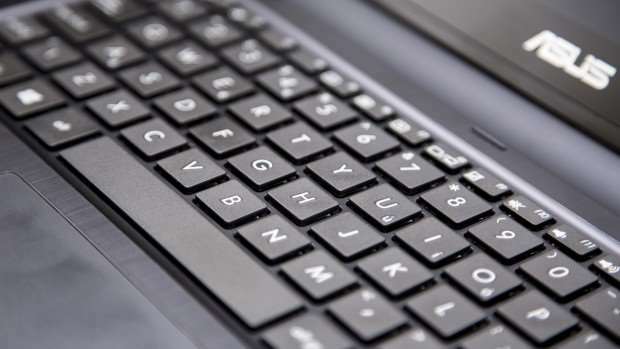 The Flip is an 11.6in laptop and relatively compact with it, so the keyboard is a little cramped and definitely best suited for those with smaller hands. Since its keys aren't full-sized, I often found myself accidentally hitting the wrong keys when typing quickly, but this is something you'll no doubt get used to over time. At least each key had a decent amount of travel, and they always felt very responsive. Thankfully, the touchpad is on the large side, providing plenty of space to move my fingers around. Its integrated buttons have a positive click action, too, so using it shouldn't prove too frustrating if you find yourself without a dedicated mouse. Sadly, the Flip's performance is where the TP200SA falls short. With only a dual-core Intel Celeron N3050 processor and 2GB of RAM at its disposal, this isn't a machine that's built for heavy-duty tasks. That showed in our benchmark results, which were fair considering its price, but we experienced some slowdown when using it, particularly when multitasking. Still, if your daily routine only consists of browsing the web and writing the odd Word document, then the TP200SA should be sufficient. The other thing to bear in mind is the TP200SA's limited storage. You only have a 32GB SSD to work with, which fills up pretty quickly if you want to store a lot of files locally. This is becoming pretty common at this end of the market, though. Thankfully, there's a microSD slot to expand the TP200SA's storage, but it's likely you'll be storing most files in the cloud. Of course, with no dedicated graphics, you'll be relying on the N3050's integrated Intel HD Graphics chips for playing games. This isn't powerful enough to run proper PC games, but simpler titles from the Windows Store such as Jetpack Joyride and Crossy Road worked absolutely fine, so you should still be able to do a bit of light gaming if you feel so inclined. It might not be a gaming juggernaut, then, but the TP200SA's battery life is more than payback enough. It lasted an excellent 9 hours 13 minutes during our continuous video-playback test with the screen brightness set to our standard measurement of 170cd/m2. This should mean you'll get a good day's work out of the TP200SA before you need to plug it back in. The TP200SA is surprisingly well equipped when it comes to ports, too. With USB 2, USB 3 and USB 3.1 Type-C ports, it can support multiple peripherals at the same time, and its micro-HDMI port means you can hook it up to an external display as well. Its downward-firing speakers aren't great, but they're decent enough given the price. Just don't expect to be using this as your main music-listening device. The audio was tinny and started to distort at high volumes. Luckily, the 11.6in, 1,366 x 768-pixel IPS display doesn't disappoint. While its resolution seems a little on the low side, it still produces a reasonably sharp picture, and it's bright too: We measured it at 269cd/m2, which is excellent for any laptop, let alone a budget one. We also measured the contrast ratio at 1,245:1, another excellent result, which ensures images look dynamic and solid, and colours really pop out of the screen. The same can't be said of its sRGB coverage, though, as our colour calibrator showed it was only capable of displaying 64.1% of the gamut. We didn't find this to be a huge issue when browsing through photos, but if you look closely enough, you can see that bright red and the richest blues looked a little flat. The Asus Transformer Book Flip TP200SA has its flaws, but at this price, it seems churlish to criticise it too harshly. It provides a decent middle ground between laptop and tablet, and it's a great device for those on the fence about buying either. It faces some pretty stiff competition, including the HP Stream 11, but the TP200SA beats it on most fronts. It's lighter, slimmer and has a much better-quality screen, and its battery life is excellent. It's very good value even at its regular retail price of $499, although we've seen it selling for significantly less, so make sure you shop around. The Transformer Book Flip TP200SA has excellent battery life, a top-notch screen and a great price. If you're on a tight budget – and you can live with ordinary performance and 32GB of built-in storage – this compact 2-in-1 laptop is very good value. Intel Celeron N3050 processor, 2GB of RAM, 32GB SSD storage, Micro SD reader, 11.6in backlit LED screen (1366 x 768-pixel resolution), 1.2kg weight.